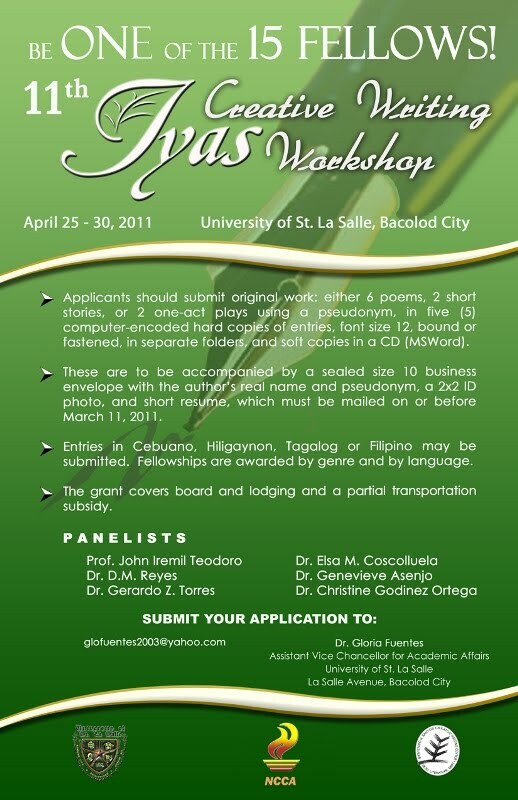 Applicants should submit original work: either 6 poems, 2 short stories, or 2 one-act plays using a pseudonym, in five (5) computer-encoded hard copies of entries, 12 font size, bound or fastened, in separate folders, and soft copies in a CD (MS Word). 15 Fellowships will be awarded. These are to be accompanied by a sealed size 10 business envelope with the author’s real name and pseudonym, a 2×2 ID photo, and short resume, which must be mailed on or before March 11, 2011. Entries in Kinaray-a, Hiligaynon, Cebuano, Tagalog or Filipino, and English may be submitted. Fellowships are awarded by genre and by language. The grant covers board and lodging and a partial transportation subsidy.